Anyone know of other printers that use a refillable cartridge? You can also use epson r280/300 printers, they have a CD tray that can hold the copper substrate and have refillable carts. 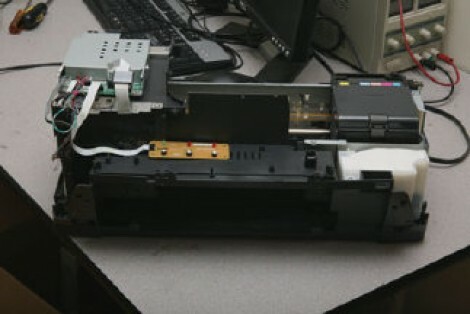 nearly all inkjet printers have cartridges that could be refilled using a syringe. At the moment i am trying to find a cheap flatbed plotter, to try another method by using a blueray laserdiode to print on photoresist. Now I read this, i will try to modify an old HP printer to do this. I’d like to make one of these. If I made one I’d want to use it rather than fiddle with it all the time. Are we at that point yet? This is neat but as a creature of habit I stick to photofabrication. Works great for me. @hubert: love the plotter idea; definitely want to try it with my old HP 7475. However, I don’t think your HP printer will work for the process in the article; AFAIK, they all use “bubble jet” heads that require vaporizing the ink. This process likely requires an Epson printer which uses piezoelectric heads. Paint + ablate away paint with laser etcher = win. One correction: Printed PCB must be heated to a specific temperature (around 230C) to cure it and make it etch resistant. The first time i’ve seen this method was a few years back and it seemed to produce great results. I still find it complicated because of the printer modification and curing. And I don’t know how you could align the images if you want double sided pcbs. @bogdan: My thoughts exactly. If you have the layers printed out on paper, it’s fairly easy to align the layers using a pair of sewing needles. alignment wouldn’t be hard. Set up a drill press jig to notch the pc board slightly on the left and right sides, then drill out the printer carriage on both sides in a similar place and put some short pegs through the holes. Woodworkers solved these alignment problems long ago and have been getting surprising accuracy. Of course, once you have a two-sided board you need to build an automated driller. Next thing you know, you’ve DIY’ed a pc board fab facility. It’s probably easier to pay some rapid prototyping house unless you’re doing a longer run. Actually , the cost per starts paying of not on longer runs, but on many short or single runs. A friend of mine owns a design business. He uses his own fab gear for prototyping, then sends the debugged gerbers to a fab house for the run. Hone fab is absolutely not cost affective for more than 3 or 4 boards. This is good stuff. All they have to do is get a homebrew solder masking down and then we can circumvent commercial companies completely. This is the stuff that MAKES the Maker revolution. You can find a number of projects that work in a similar fashion (and solve similar problems) right here on HaD by searching for ‘DTG’. @hubert, I tried this a while back. Ran into a problem with driving the diode fast enough and other things. What I did do is work out a system of using an HP laserjet mechanism, scanner, 23K256 and burner diode/driver. The idea is that the 23K256 buffers the drive signal so that in “continuous” mode it outputs directly to the laser so it correctly indexes on each quarter rotation. The PC instructs the scanner to do a full A4 page, so as the head moves the entire board is exposed.